iTunes 12 has its share of problems. But there several tasks that iTunes is good at. iTunes gets a lot of criticism, including a lot that I dish out, and much of this criticism is justified. 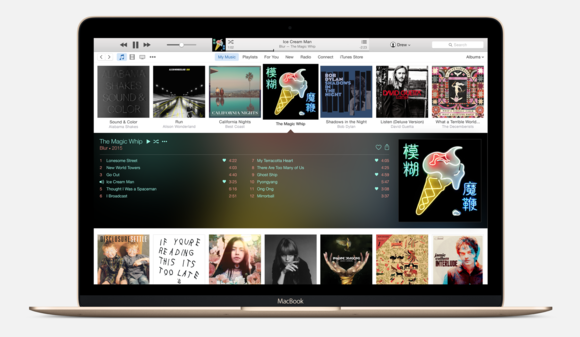 iTunes has lots of problems syncing iOS devices, iTunes Match and iCloud Music Library are confusing, and the interface, particularly in iTunes 12, is confusing. To be fair, though, iTunes does get a lot right. You can condemn it for many problems, but it's good to sometimes take a step back and give it credit for the features that work so well that you hardly pay attention to them. 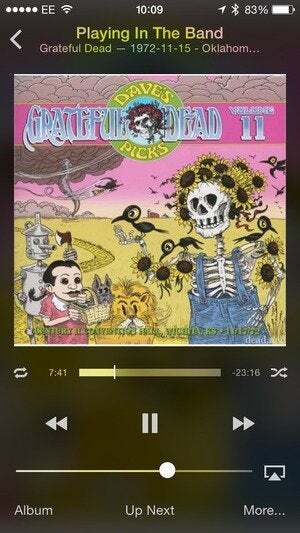 I've picked ten things that iTunes does right. If you remember back in the days before iTunes, CD ripping software—at least on the Mac—was far less user-friendly than iTunes. You had to manually enter tags for your music, and then move the files into iTunes or whichever app you were using to play your music. iTunes made big improvements by unifying the process of ripping, tagging, and adding music to your library, and also through the integration of Gracenote to fetch tags for most of the CDs you rip. While iTunes may rip some CDs slowly, this seems to be more because of the CDs than the app itself. 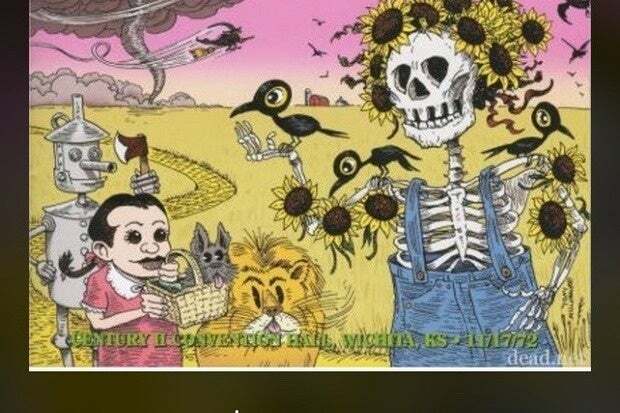 I rip a lot of CDs with iTunes, and it acquits itself well. The ability to create and manage playlists is one of the revolutions of digital audio. Instead of only being able to listen to the tracks you copied to an MP3 player in a folder, iTunes lets you make as many playlists as you want. They're easy to set up, and easy to manage, and you can even organize them in folders if you have a lot of them. Playlists are one thing, but when they got smart in iTunes 3, that changed everything. You can set up playlists to find music by specific artists or genres, music you added recently or years ago, music you've played a lot or never listened to. And you can shuffle them too. iTunes' ability to play videos let you watch anything in your iTunes library on your Mac or PC, at home or when traveling. If you use iTunes to manage your video library, it's a lot easier to play videos from iTunes than from a video-only app. You can watch your favorite movies or TV shows with the app, and it remembers where you stopped if you haven't finished watching a movie. If you're watching episodes of a TV series, it shows you which ones you've seen. iTunes is certainly not the only app that tags digital media files; they all do. But iTunes does it quite well. While you may not like the way the Info window is laid out, or the way you navigate it, it's still very efficient, and a lot easier to use than many other apps. 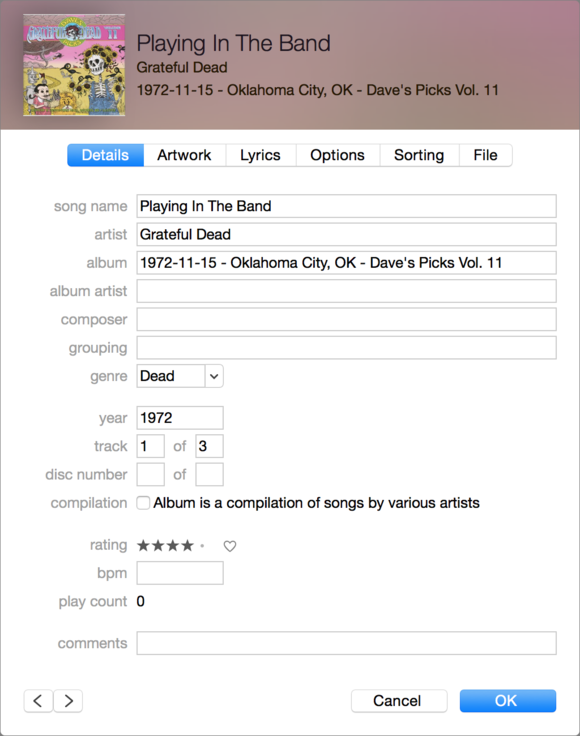 Set tags for your files in iTunes. While iTunes 12 mixed things up as far as navigating libraries is concerned, iTunes does offer a lot of different ways to view your content. You can view music by album, artist, genre, or by song, and the Column Browser lets you drill down through your library. Other types of content have similar views. You can choose how to view each library—Music, Movies, etc.—and each playlist. It can be hard to grasp, but it's quite flexible. iTunes lets you share your library over your home network. Yes, this is fraught with problems, and sharing a large library to an iOS device generally doesn't work. But it's easy to share your music library throughout your home, allowing other people in your family to listen to your music easily. Control music with the Remote app on an iOS device. Apple's Remote app for iOS lets you control iTunes playback on a computer. This is great if you're streaming music via AirPlay to a speaker, say, in your bedroom. Or if you're just sitting in the living room, streaming music through an Apple TV. When Apple went into the music retail business, it wasn't a big surprise, but it changed the landscape of the music industry. Now, the iTunes Store sells music, movies, apps, books, and more. It's generally easy to navigate, and the seamless process of buying digital content and having it download to your library is nearly foolproof. 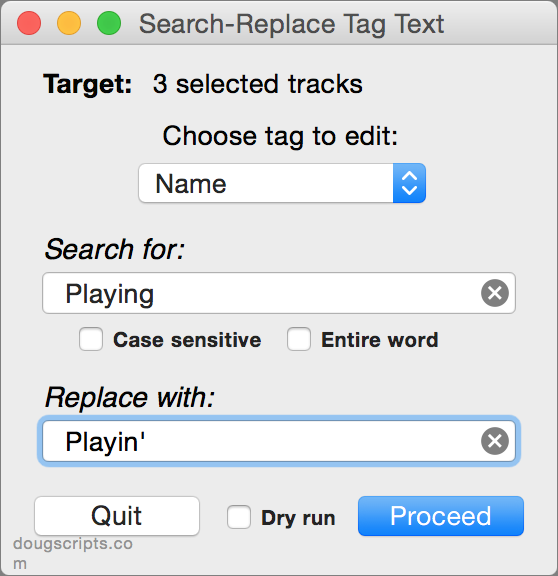 Search-Replace Tag Text, one of the many useful AppleScripts that make iTunes easier to use. If you use a Mac, you have the ability to extend iTunes using AppleScript. Thanks to Doug Adams, whose website Doug's AppleScripts for iTunes houses hundreds of scripts, we have the ability to do all sorts of things that iTunes can't do, such as manage files, change tags, work with playlists, and much more. It's great that Apple has provided support for AppleScript in iTunes, and I hope they continue to do so.